When it comes to eLearning Solutions, the students who use eLearning to further their education still need support throughout their educational career. This means that students need access to the colleges they study with online, at all points along their educational path. Today, communication is paramount. Providing students with clear, effective modes of communication with instructors and professors helps to propel their success with the course they have taken. Many online instructors schedule regular virtual office hours for the reason of communicating with students, just like those in brick and mortar, and it generally works very well. Incorporate the chat function with instructors and fellow students and a support network is established. According to Northwestern, here are some best practices to include when teaching an online course. Be clear about availability and contact info: Online professors should include a way for students to gain quick access when they have a need. This means the instructor should clearly provide an email address and let students know how quickly they can expect you to respond to their inquiry. Sharing a phone number or social media link is also an option. Be active in discussions: Online courses typically include a discussion board. This is a great place to start for professors to interact with students. Be part of the discussion and answer any unresolved questions or issues facing the students. Provide feedback: After a student turns in an assignment, it is up to the professor to provide meaningful feedback in a timely manner. Send regular announcements: These announcements can include upcoming events, deadline reminders, job listings, and more. Use content that shows your personality: By using video or audio recordings, students can gage the personality of the professor they are working under. Actually seeing the teacher and hearing his voice will create a connection between student and teacher. The needs of eLearning students will vary from student to student and course to course. However, some of the most common reasons for an eLearning student to need assistance from a professor, for example, can include getting clarification on an assignment, going over feedback regarding an assignment, or even getting an extension for an assignment. So how does a student in need communicate with a professor, a career counselor, or even the registrar? In some cases, the student only needs to pick up the phone to reach the desired person. In other cases, online schools may use chatting software, video conferencing, and email. Whichever communication tool is used, it must be clear, easy to use, and keep the communication process going. An eLearning course needs to have clear communication from the beginning, according to the article “How Do You Communicate with Your E-Learners”?. This way there is no confusion by the student receiving the information, making them able to reach the learning objectives set by the course. However, if an eLearner does not perceive the course information as it was intended by the eLearning course, learning objectives will not be reached unless there is a clear path of communication between the student and the professor to rectify this misunderstanding. A student may also need help at a particular point during an eLearning course is if they come to the course with a lower level of experience than their fellow students. Other reasons can include cultural differences or the learner’s commitment to the course. 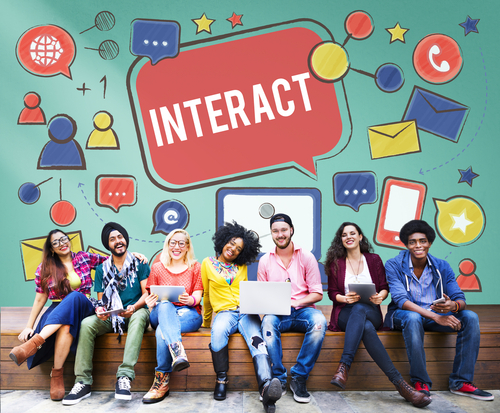 While a brick and mortar university or college presents the professor and student with a continuous stream of communication during class time and office hours, this constant communication simply doesn’t exist for eLearning students in most cases. Instead, the course content is delivered to the student who is expected to understand and process the information to meet the learning goals. In the beginning, the professor has no way of knowing which students understand the course content and which do not. So how does a professor or college teacher assess a learner’s understanding of the material? By chatting it up! Professors who deliver online content courses should be available to give students valuable feedback on their work and assess their understanding of the course, especially when a student is struggling. This means that professors of online courses should have a way for students to easily communicate any difficulty they face during the life of the course. Making available office hours where students can call in and chat about the course content or a particular assignment is important. Professors can also utilize conference calls and email to help clarify any confusion a student may have about the course. To avoid any misunderstanding or ambiguity about an online course, universities and professors should design their courses with clear communication in mind right from the start. ELearning solutions and custom content creation helps to minimize a lack of understanding by the student through well planned out content creation that effectively communicates the intended material. To learn more about creating custom content for an eLearning course that clearly presents the material’s objectives and offers frequent, meaningful communication, contact Focus Eduvation today.